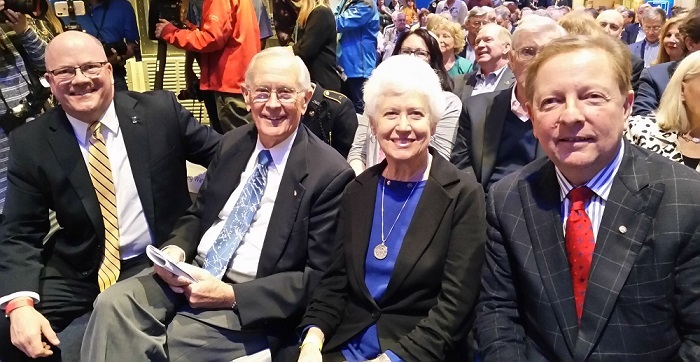 Mike Olson, astronaut Charlie Duke, Dotty Duke, and Tom Uram. 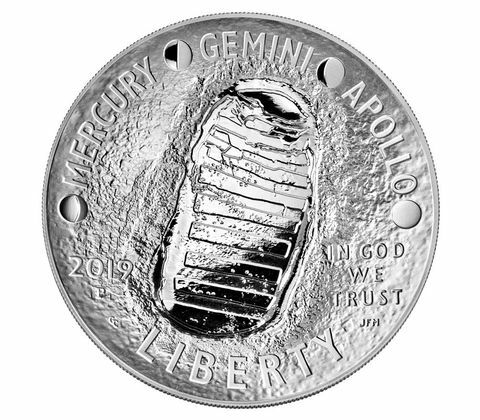 Rarely has a U.S. Mint commemorative coin program elicited as much interest as the 2019 Apollo 11 50th anniversary coins did in the run-up to their January 24 release. 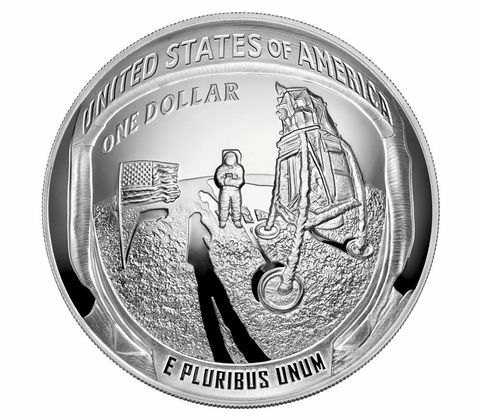 With a theme that undoubtedly resonates with both American and foreign collectors, and potentially non-collectors who learn of their existence too, the coins’ appeal has a lot to do with the fact that the most active numismatic demographic group — men in their mid-50s or older — were alive in 1969 and vividly recall the moon landing. The original proposal for this program — only the second set of curved U.S. coins after the 2014 Baseball Hall of Fame issues — dated to a November 2014 Citizens Coinage Advisory Committee meeting when member Michael Olson suggested it. The legislation creating the program was passed in December 2016 after an extended effort to secure congressional approval. 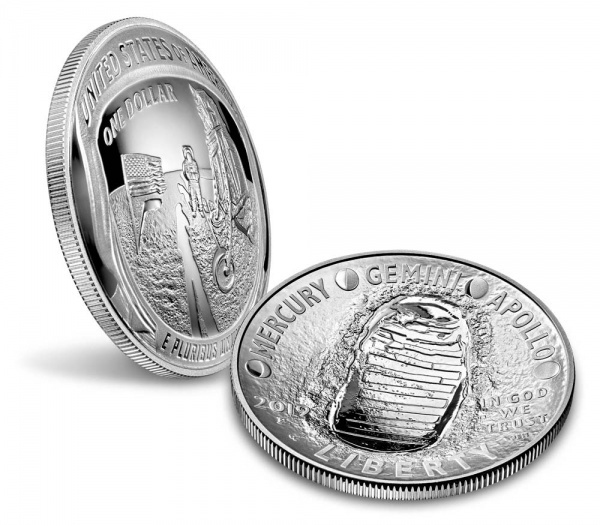 In the months following the October 11 launch of the designs at the Smithsonian’s Air and Space Museum and the December 13 first-strike ceremony at the Philadelphia Mint, interest in these coins appeared to remain very high, particularly for the five-ounce silver Proof version (the first curved and reeded Proof piece from the U.S. Mint) and the two-coin set with a clad Apollo 11 half dollar and a clad Kennedy half dollar with an enhanced Reverse Proof finish unique to the set. Both products were widely expected to sell out quickly. Plus, all the silver coins were for the first time struck with .999 fineness, rather than the usual .900 — something collectors have requested for years and that brings our coins in line with what world mints produce. Sales began on January 24 at 12:00 noon EST on the Mint’s website at retail sales locations at the Denver and Philadelphia Mint’s and Mint headquarters in Washington, DC and at an event held at Kennedy Space Center in Florida. The Mint’s site was probably the slowest it had been since the 2011 release of the 25th Anniversary American Silver Eagle Set, and many buyers reported experiencing delays getting through the various stages of the ordering process. Astronauts Memorial Foundation board member). 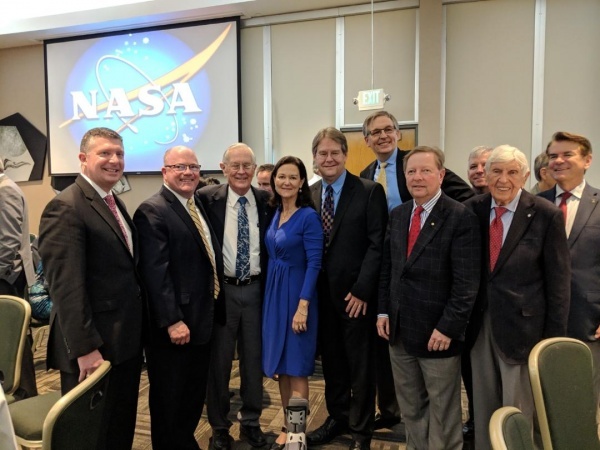 The launch event was attended by several astronauts and their families and other invited guests such as current and former members of the Citizens Coinage Advisory Committee who played roles in creating the coins. These included new CCAC Chairman Thomas J. Uram, who delivered remarks on behalf of U.S. Mint Director David J. Ryder and who was a member of the jury that selected the winning obverse design; former Chairman Gary Marks; current member Erik Jansen, who represents the general public; and Michael Olson, who is also a member of the Astronauts Memorial Foundation’s board and noted that astronauts and their families at the event were excited about the coins, which sold briskly. Tom Uram delivering remarks at the launch event on behalf of Mint Director David Ryder. 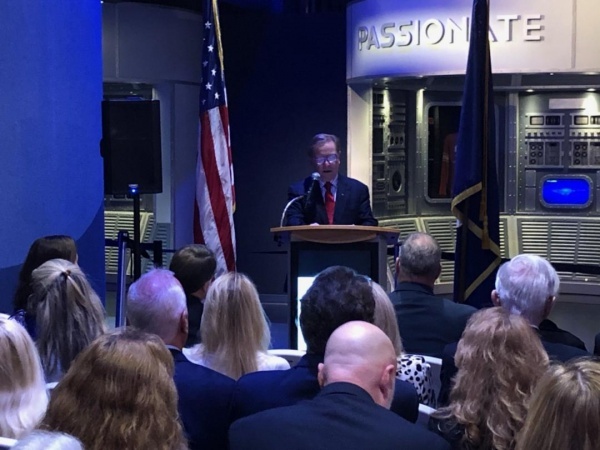 During his speech, Mr. Uram said that a complete sellout of the program (which will run through the end of 2019, or as long as the coins are available) would generate $14.5 million for the three recipient organizations: The Astronauts Memorial Foundation, Astronaut Scholarship Foundation, and the Smithsonian Institution’s Air and Space Museum’s exhibit on the Apollo 11 mission. Every coin that the United States Mint produces helps to tell a story that teaches us about America’s history or connects us to a special memory. Each time a person looks at one of these commemorative silver dollars, it will serve as a reminder of the unprecedented engineering, scientific, and political achievement that secured our Nation’s leadership in space for generations. 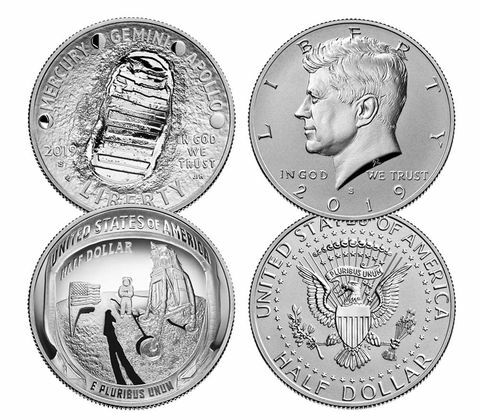 We will be producing a special set featuring a U.S. Apollo 50th Anniversary half dollar paired with an Australian 50th Anniversary of the Moon Landing one-ounce $5 silver coin. This jointly-issued set magnificently symbolizes our long-standing alliance and friendship with Australia. 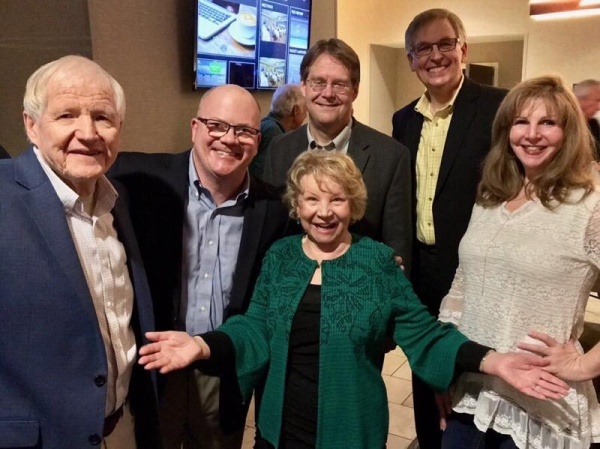 Former legislative aide to Congressman Posey Dieter Jobe, Mike Olson, Charlie Duke, Ann Collins Starr (daughter of Michael Collins), Gary Marks, Erik Jansen, Tom Uram, Andrew Uram, and Thad Altman. 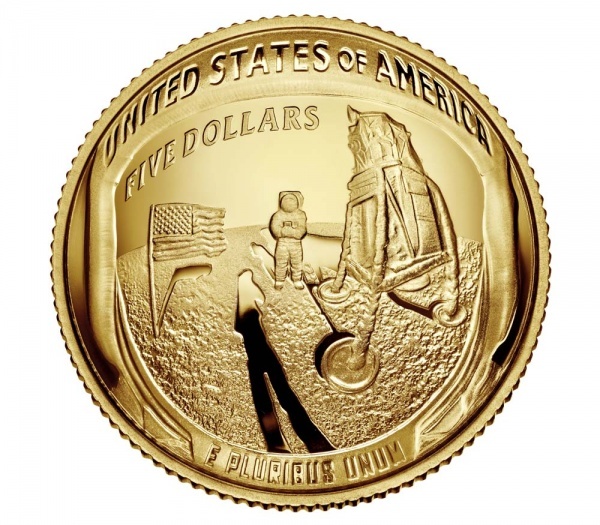 The surcharges from this coin have been authorized to support the missions of three non-profits who represent the history of the space program while supporting the next generation of explorers, innovators and calculated risk-takers who will continue to discover new frontiers. As for the secondary market, the fact that few dealers were offering premiums to buyers willing to sell directly to them, apart from a company offering a $75-premium for a five-pack of the two-coin half dollar set, suggested that they initially may not have expected the coins to have a lot of secondary market potential. Or, dealers simply believed they would not have difficulty obtaining what they needed directly from the Mint and planned to gauge buyer interest before making large purchases. An early sell-out of the five-ounce silver Proof dollar, or the two-coin half dollar set, failed to materialize on January 24, but the five-ounce piece went into backorder status within eight or nine minutes with an anticipated ship date for additional coins of May 1. The potential problem with that is that most buyers of modern U.S. coins do not want to purchase coins that will not ship for months, in part because some want to have them graded and be eligible for PCGS First Strike and NGC Early Release status, and in part because they simply do not want to wait a long time for their coins. The mystery factor is how many of the five-ounce pieces were produced of the 51,271 ordered on the first day, which many purchasers believed was substantially less than that number. Many buyers reported their orders had shipped during the first or second day of sales, while many others who ordered before the backorder status began still had their orders back-ordered, which they found frustrating. When I was on the committee, I urged both Moy and Peterson [former Mint Director Edmund Moy and former Deputy Director Richard Peterson] that avid numismatists needed to be added to the leadership of the sales and marketing staff. Without the insights such folks could bring to decisions we get the type of disconnect we saw yesterday; almost immediate back order status that discourages potential buyers.” Marks added that “The coins are stunningly beautiful. The production side of the Mint should be recognized for their great work. The Mint does not strike all the coins for any specific program option but mints to an initial marketing forecast. It is possible, as some collectors speculated in coin forums, that the Mint had difficulty producing enough coins before the launch, especially since it had been reported in Coin World that there were production issues with the five-ounce coins. Each “individually machined” die, which initially took 14 hours to produce (that was later reduced to 11.5 hours), was only able to make 100 coins. Perhaps not enough dies were ready in advance of the launch to make all the coins, or the Mint decided to gauge demand before producing additional dies and coins at considerable expense. Almost 300,000 coins were sold on the first day. Additionally, the Bureau of Engraving Apollo 11 engraved print sold out on the first day as well. Mr. Olson, the former CCAC member who not only proposed the program but also spearheaded the effort to turn it into a congressionally-authorized commemorative program, said he was very pleased with the first day’s sales. He noted that, unlike in past instances when many collectors were unable to order the coins they wanted because so many went to dealers and flippers, this time “the end user,” i.e., the collector who plans to keep their coins, was able to get what they wanted. Mr. Olson added that he expects all product options to sell out by the end of the year or sooner and that recipient groups will be promoting sales of the coins. He also said it was “a good move” by the Mint to lift household limits the second day of sales. 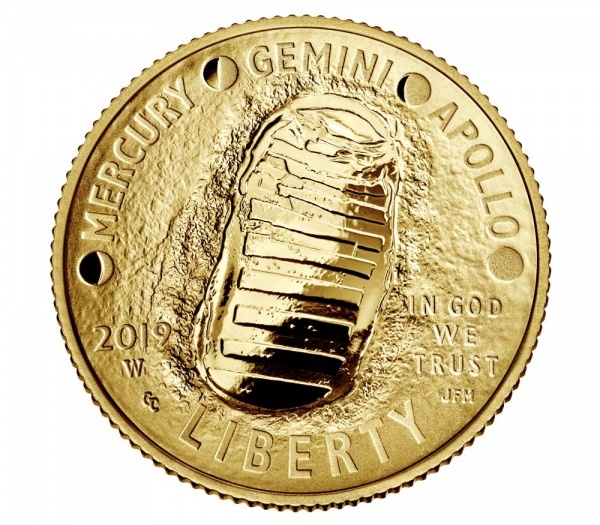 To him, the footprint on the reverse of each coin is “the most outstanding feature,” especially on the gold Proof coins because the mirrored footprint really pops, contrasting with the more matte background of the lunar surface. In addition, in exclusive comments for Coin Update, Mr. Olson said that he is exploring the possibility of working to promote another coin program that would honor the Space Shuttle program that began in 1981 and ended in 2011. The fact that no coins sold out the first day, including the two coins most widely expected to do so, led coin forum bloggers like many on Mint News Blog and other sites to proclaim the program’s initial sales “dismal.” They also suggested it implied the future of numismatics within the U.S. is not bright, an opinion expressed frequently by many collectors, but which other dealers and collectors believe does not reflect the overall state of the hobby. For example, attendance and sales were very strong at the recent FUN coin show in Florida, and there are also other indicators of a strengthening market such as rising precious metal prices and increased demand for bullion coins, among others. Early media reports also emphasized the lack of early sellouts, but the initial sales numbers probably said less about the program’s success and more about the caution of flippers of U.S. Mint products after mixed results in recent years. Besides, the $5 gold Proof coins went into backorder on January 27, which further suggested that disappointment about initial sales was likely premature. On January 27, one major retailer listed PCGS-graded examples of all the Apollo coins with the five-ounce piece listed at $550 in Proof 70 and $320 in Proof 69, and those prices increased soon afterward. Proof 69 and 70 examples of the $5 gold coin sold out immediately, as did all their five-ounce coins and Mint State and Proof 70 one-ounce coins. On eBay, ungraded pucks, as many call the large silver pieces, settled in at around $300-$320 the day after their launch, while Proof 70 coins brought $600-$700 and even $900 for examples in holders with signatures of astronauts. By the weekend, ungraded coins continued to move a little higher, to $350 each. By Sunday, more sellers had presale offers for other coins, and the one-ounce coins in MS and PF-70 continued to move up in price from about $170 or less to $250 and more per coin and several major sellers sold out of their initial supply. Collectors of U.S. Mint coins obviously would prefer that their purchases at least maintain their value. But particularly when it comes to commemoratives, even high-interest programs like the 2014 baseball coins or the new Apollo 11 coins, it is advisable not to view them as investments or money-makers apart primarily from coins in the top grades. With the Apollo issues, some collectors believe the high price being paid for PF-70 coins has a lot to do with the large surface area of the coin, making it harder to get the top grade. That remains to be determined by the PCGS population and NGC census reports. Moreover, the success or failure of these programs can be measured in different ways, not just by how quickly they sell out, or whether they sell for more than issue price after their release. Perhaps too many buyers place excessive emphasis on this aspect, especially since commemoratives are intended mainly as items to cherish and enjoy. Considering how many times buyers have complained about being locked out of high-profile programs like this in the past, the fact that people could order the coins they wanted, even if they had orders on back order, was significant. For the Mint, the collector, and the recipient organizations, the Apollo program has already been a huge success in a short period. And the program has also earned an important place in the annals of American numismatics.